A new molecule, photoactive Flp recombinase, has been developed for use in an optogenetic technique that can deliver non-invasive genetic manipulation in the deep brain tissue of mice. A research team from the Korea Advanced Institute of Science and Technology (KAIST; Daejeon, South Korea), led by Won Do Heo, has successfully developed a novel light-sensitive recombinase, for use in an optogenetic technique capable of inducing genetic modifications in vivo. The recombinase, photoactive Flp recombinase, will allow neuroscientists to inflict genetic manipulations in the deep brain tissue of mice by simply illuminating them with an LED. Existing techniques for obtaining spatiotemporal control of gene expression for the study of complex neural circuits, are often cumbersome and time consuming, requiring the establishment of knock-in mouse lines, and only allowing for a limited scope of control due to the reliance on a small set of genetic promoters. 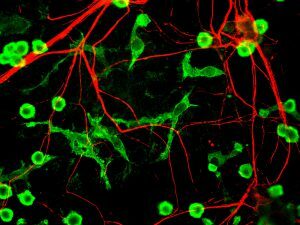 To overcome these limitations Heo’s team focused on optogenetic approaches to provide a more sophisticated technique for the study of neural circuits. The team acknowledged Flp recombinase as a potential protein of use and identified an appropriate split sight in the compound that rendered Flp recombinase capable of activation by reconstitution. The Magnet system of light responsive modules was selected to fuse to the C-terminal of each Flp fragment to induce heterodimerization in response to a light stimulus. To verify the utility of the Flp recombinase molecule, the team used it to display transgene expression of GFP labeled proteins from an Flp reporter plasmid in specific regions of the mouse brain. The expression of these GFP labeled proteins was stimulated by activation of the photoactive Flp recombinase after the external exposure of the mice to a blue LED light. This Flp activation was found to be effective in the deep brain tissue, producing results in the hippocampus and the medial septum. This novel system for in vivo genetic modification provides a promising technique for the potential study of spatiotemporal functions of specific genes within subpopulations of cells. The use of photoactivatable Flp and its non-invasive light activation also avoids the use of chemical or physical interventions in the brain which may subsequently affect the results of a study, making this technique highly valuable in the study of complex neural circuits. “It will be a great advantage to control specific gene expression desired by LEDs with little physical and chemical stimulation that can affect the physiological phenomenon in living animals,” explained Heo.